I had my first popover at The Zodiac Room, a restaurant that was located inside of Neiman Marcus. My friends and I would go there for special occasions. I remember during my first visit when the dapper-looking waiter brought the popovers to the table with a side of strawberry butter. The popover looked totally foreign to me, so I just broke off a little piece, dabbed a little butter on it and took a bite. Best.Bread.Ever. It has this light airy texture to it that is different, yet divine. I added cheese. Cranberry cheddar cheese to be exact. What bread doesn't taste good with cheese? I was cruising the cheese section of the grocery store and saw the cheese, which I thought would be different and totally appropriate for the holiday season. 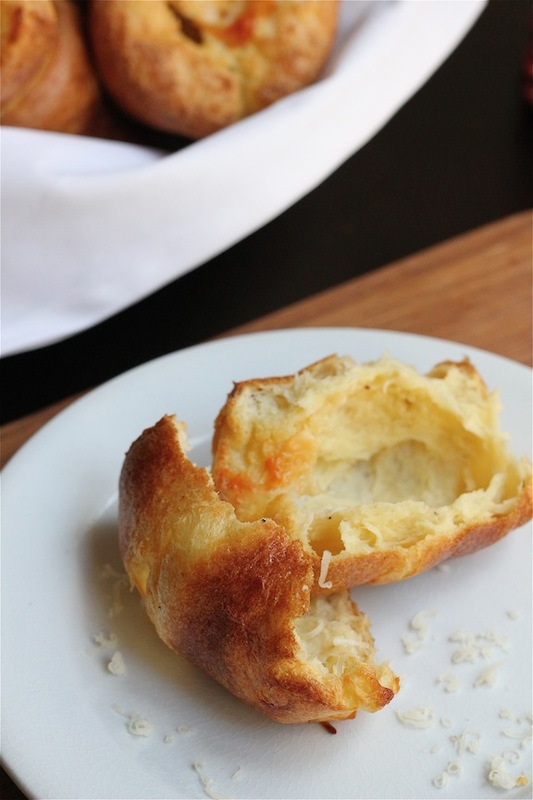 Let me just tell you- if you love good cheesy, elegant-looking bread and an easy recipe, you will LOVE these. Preheat the oven to 375 degrees and position the rack on the bottom third of the oven. Place the muffin pan on a cookie sheet and place it in the oven to warm. 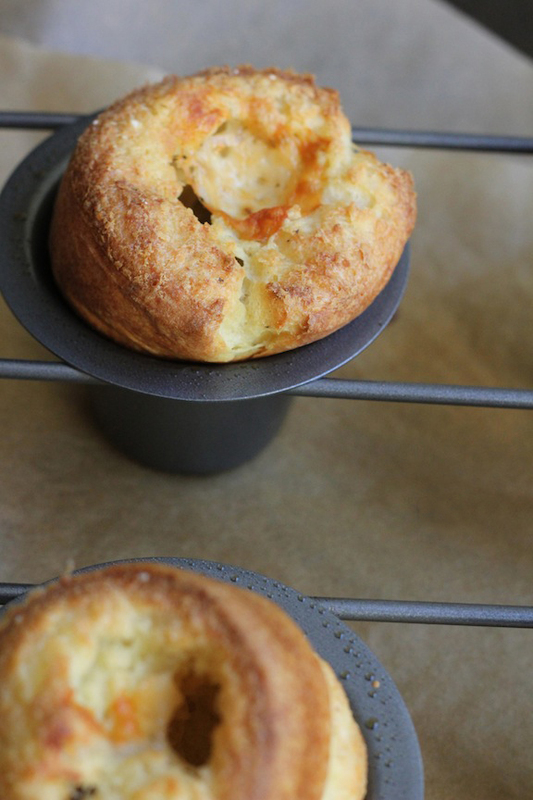 Note that these can be made in a regular muffin pan or in a popover pan. In a small saucepan, warm the milk over medium heat until it is hot, but not boiling. You will see small little bubbles on the edge of the pot when its at the right temperature. Remove the milk from the heat. In a bowl, whisk the eggs, salt and pepper until smooth. Slowly, very slowly, whisk in the warm milk. Add the flour and whisk until just combined. The batter might be slightly lumpy, but it's ok. Remove the muffin pan from the oven and spray the muffin cups generously with nonstick cooking spray. Pour about 1/3 cup of the batter in each muffin cup. 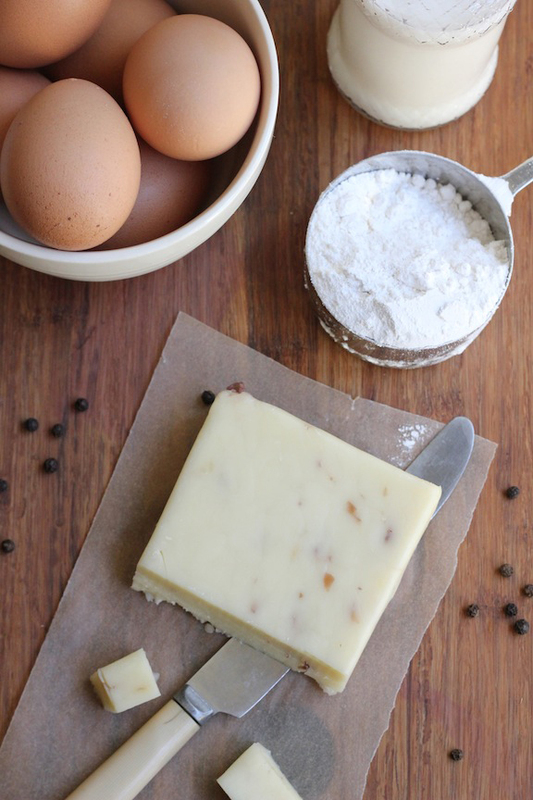 Place a cube of cheese on top of the batter in each cup. Bake the popovers until puffed and golden brown, about 40 minutes. If you open the door to the oven while they are cooking, they will collapse, so be patient! 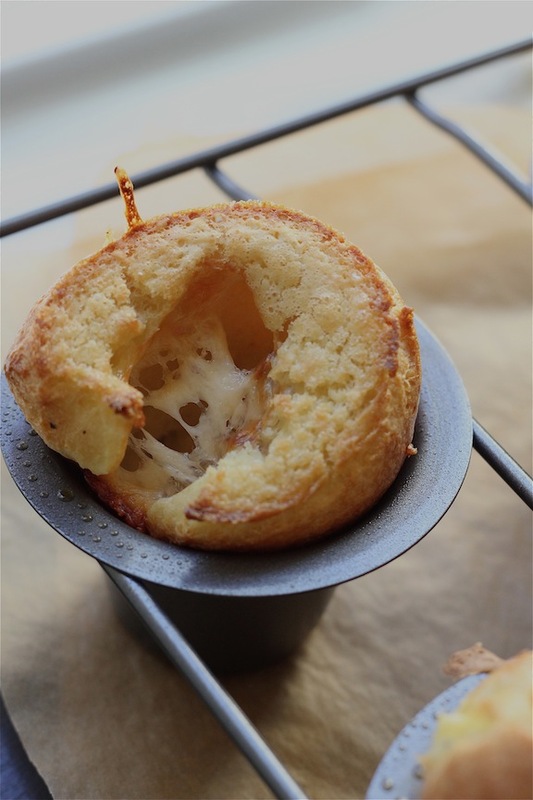 Remove the popovers from the pan, sprinkle them with grated cheese and serve immediately. 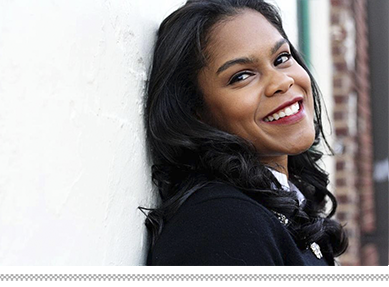 Update: I'm sharing this recipe with Natasha at Schue Love! 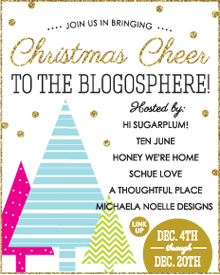 She is hosting a Holiday Recipe Party, so be sure to stop by! these look amazing! i had my first popover on thanksgiving this year. they're dangerously good. pinning these immediately! You have out done yourself with this one. My mouth is seriously watering. I have got to find some time to make these ASAP!!! Thanks girl! Let me know if you make them! I'm utterly smitten with this recipe. I adore popovers. These sound incredible! 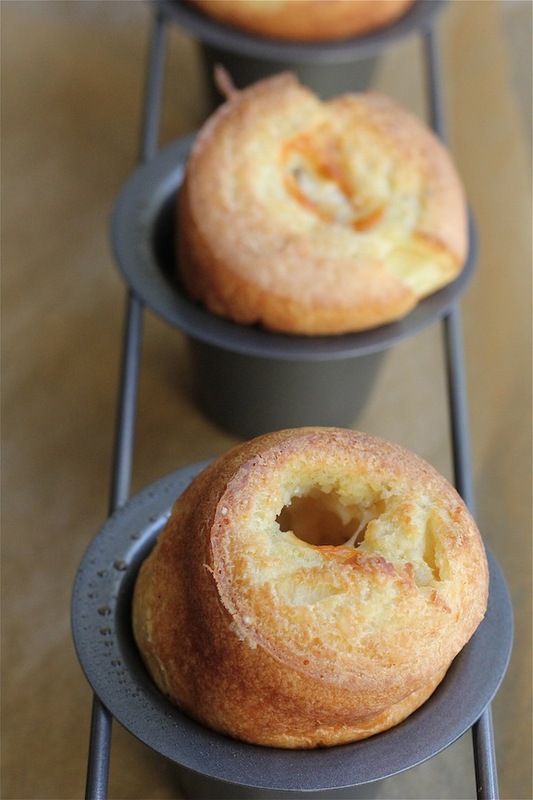 I'm such a huge fan of popovers, and the combo of flavors in these sound to die for. Stop it!! Okay--seriously--I love popovers!! This recipe sounds amazing. Will definitely try it soon! These look divine! I absolutely love popovers. I have made them a few times, but really should make them more! I do love the ones at Neiman's too! I am going to the Zodiac for our office Christmas lunch next week. I love it and can't wait. LOVE!! Oh I have the biggest obsession with popovers. Will have to try it!! hey Tiff! it's Kim and I'm catching up on your blog!! totally brings back such great memories!! miss you .